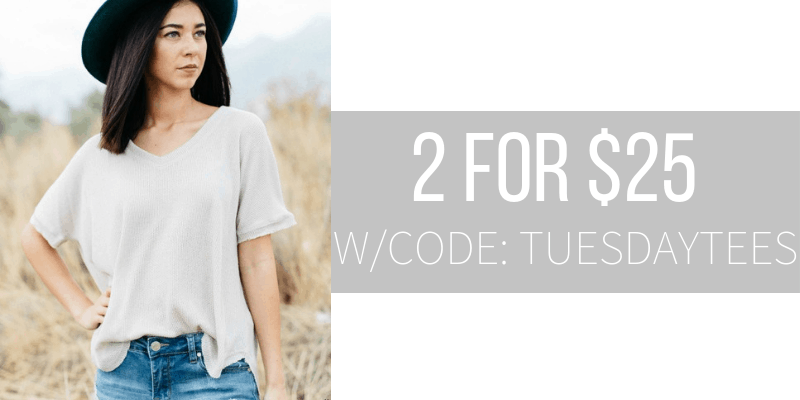 Two for Tuesday with Cents of Style – 2 Tops For ONLY $25.00! If you love the latest clothing, shoes, and accessories with an eye on affordable prices, then I think you will love Cents of Style. My favorite day to shop is Two for Tuesday with Cents of Style. Be sure to check out the Cents of Style Daily Deals tab. My favorite day to shop is Tuesday when they feature 2-for-Tuesday. It is a great way to score something fab for yourself and then tuck the other item away in your gift closet so you always have something on hand to give as a gift or to brighten someone’s day! We have affiliate relationships which means we may earn a small referral commission at no additional cost to you if you shop using our links. 2 Tops For ONLY $25.00! The code is TUESDAYTEES and it makes the final price just $25.00 FOR TWO TOPS! (when 2 are purchased!) Don’t forget the FREE Shipping! The code is active 11/13/18 until midnight. You are amazingly refined and you ooze class. You are a Hepburn, a Kelly, and all the classics in between. When you have a night out planned, you can never go wrong with a beautiful high waist pant. Dawn is a simple lightweight paper bag waist to pair with a simple t-shirt and wedge shoes for some sophisticated fun. Quick link to today’s Cents of Style deals. Become a Rewards Member and earn points for every dollar you spend! Per our company policy, you can exchange your item and the customer is responsible for the return shipping charges with the exception of defective items. Cents of Style offers the latest woman’s fashion & accessories at affordable prices.